Did you know every one of a famous fast food restaurant’s French fries goes through a Cornell pump? From sorting the potatoes through hydro-transport to flash cooking in hot oil, the fries are at their tasty best in part because of Cornell. Our line of food processing/ hot oil pumps allows products such as eggs, salmon smelt, peas, carrots, –obviously potatoes—and much more to be moved with far less damage than a traditional convey belt, and then be fried if necessary. And our line of self-priming pumps are ideal for waste water extraction from the plant. Plus, we provide refrigeration pumps to keep the raw vegetables cool before processing, and the food fresh after its been through the plant. Think of Cornell next time you bite into crispy fries, and even the ketchup to dip them. 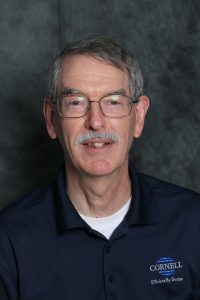 Great Lakes Regional Manager, Duane Hargis, retires from Cornell Pump today. 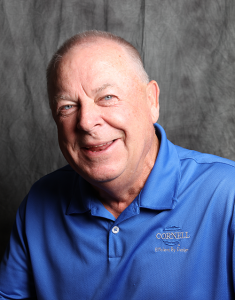 Duane joined Cornell Pump in May of 2007, and has spent 12 years focused on municipal, industrial, mining, and rental accounts. 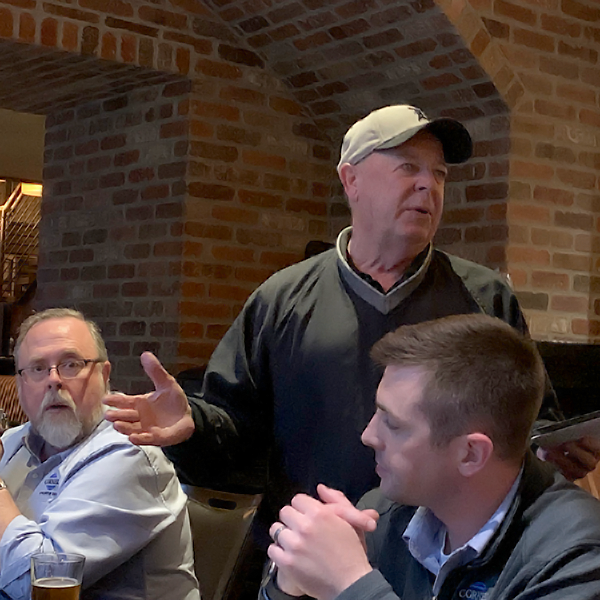 With more than 40 years in the technical and equipment sales, Duane remarked he “saved the best for last.” We’re glad he enjoyed his career at Cornell Pump, and we will miss him. We’re sure he’ll enjoy his retirement; playing golfing, visiting family, making and listening to music, and travelling South whenever he can. Wishing all the best to Duane, and his wife, Brenda. 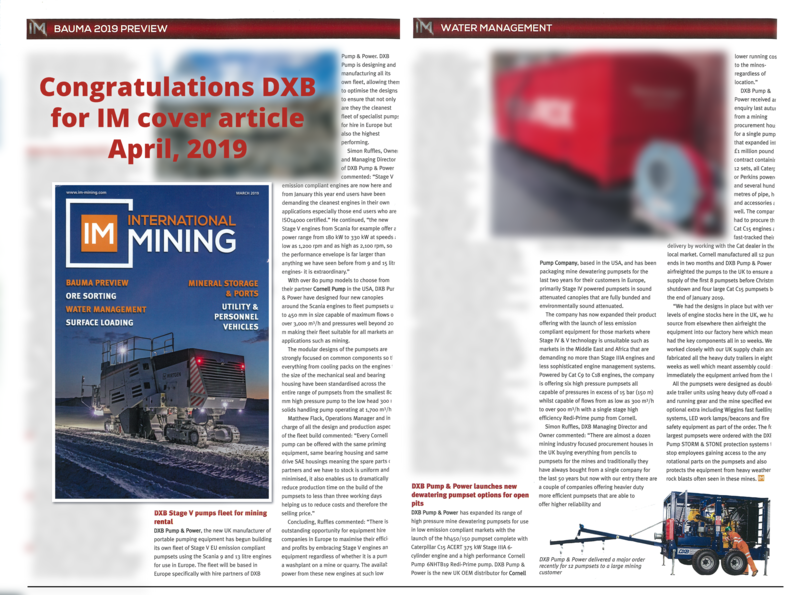 Cornell Pump congratulates our distributor, DXB Pump and Power, on getting two articles in the March 2019 edition of International Mining. 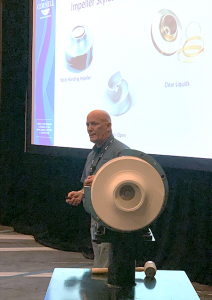 Focusing on a new line of packages designed for open pit mining, and DXB’s Stage V EU emission compliant pump sets (all featuring Cornell Pump wet ends), the articles talk about DXBs capabilities in fulfilling customer demands. We appreciate DXB’s efforts, and look forward to success they will have with these and other products. 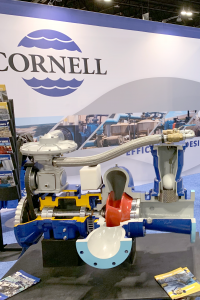 It would be an April Fools’ Joke if Cornell Pump announced a centrifugal pump with 100’ feet of suction lift, no NPSH required, and head of 2000’. An impossibility. We promise-it is true; and Cornell won’t make a fool of you for using the most robust and efficiency pumps in the industry. Cornell Pump’s first pumps were irrigation pumps used in Oregon’s fertile Willamette Valley, and agricultural pumping, including dewatering, irrigation, and manure handling remain strong markets for Cornell Pump today. 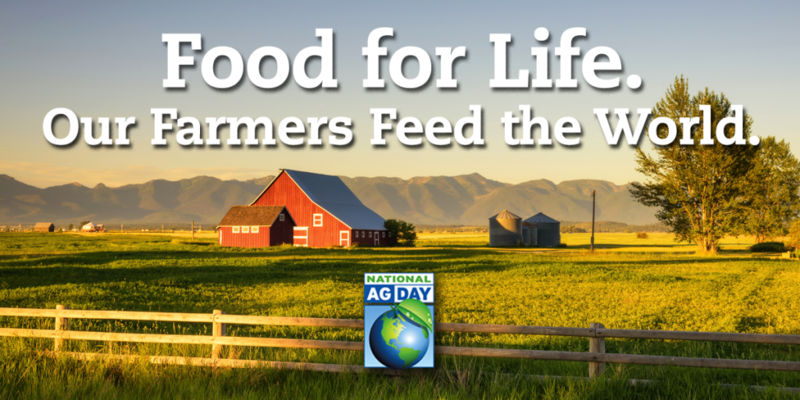 Visit www.agday.org for more information on National Ag Day 2019. 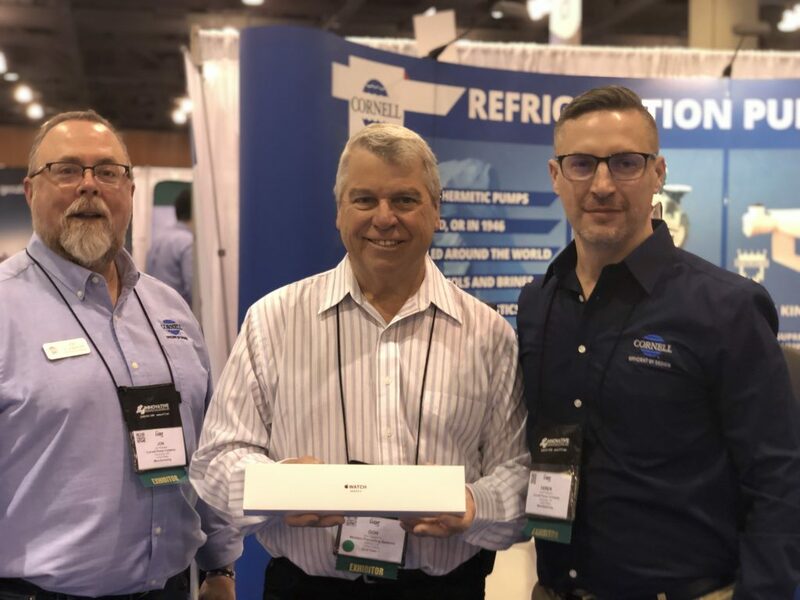 Don Tragethon from Western Cooling in Castroville, California was the winner of our Apple iWatch drawing at the IIAR Annual Conference, which wrapped up this week in Phoenix, Arizona. While Don won a prize, you can count yourself lucky too, if you need a refrigeration pump! Cornell has manufactured robust and reliable pumps for cooling systems for 60 years. Learn more about the Open Drive CB series and Semi Hermetic Arctic King series. 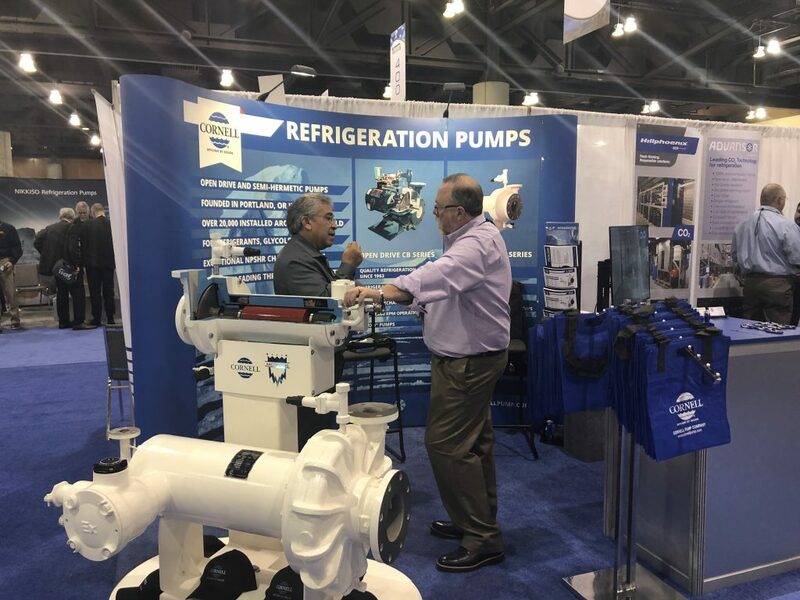 This week, Cornell Pump Company is showcasing the Arctic King refrigeration pumps at the annual IIAR conference in Phoenix, Arizona. Come talk to us and learn about the advantages of our semi-hermetic pumps. Cornell has built refrigeration pumps for over 60 years now and has solutions for ammonia, glycol, or brine-based systems. Get more information, including data sheets and brochures, from the Cornell website.